These are pieces of 3/4” thick plate bent to 90 degrees. 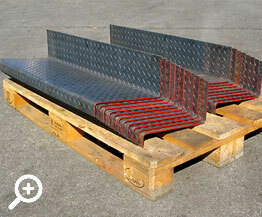 We do plat bending in-house using our 500 ton by 18 foot press-brake. 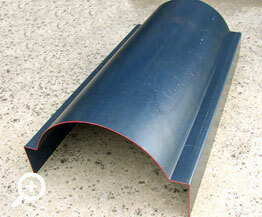 We also do plate rolling up to 1.0" thick and 10 feet in width. 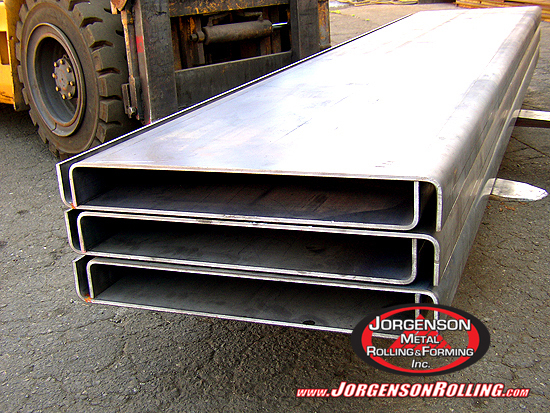 At Jorgenson Metal Rolling & Forming we not only specialize in plate bending and plate rolling, but also structural shape rolling using beam, channel, angle, pipe and tube. 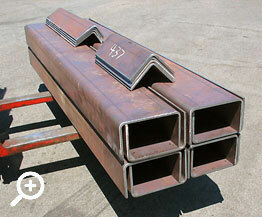 This is 3/16” thick plate that has been formed into a custom channel by being bent in two places to 90 degrees. Our shop has the ability to do ½” plate bending up to 10 feet in width, and 3/8” plate bending up to 18 feet in width using our 500 ton press brake. 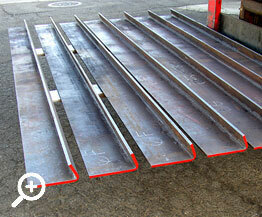 We also do plate rolling up to 1.0" thick and 10 feet in width. 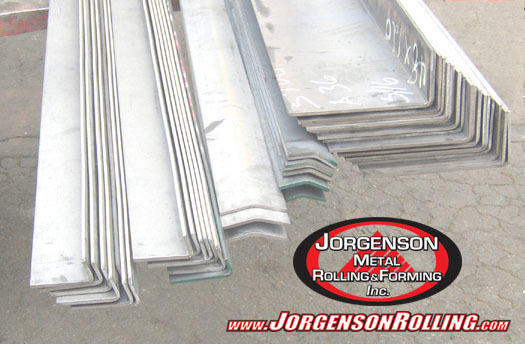 At Jorgenson Metal Rolling & Forming, we also specialize in rolling angle, channel rolling, beam rolling, pipe rolling as well as square and flat bar rolling. These are 1/4" plates that have been bent in multiple points to create a custom formed hat section that is similar to a channel. We specialize in plate bending with a bending capacity up to 500 tons by 18 feet, which can bend up to 1/2" thick plate that is 10 feet long. 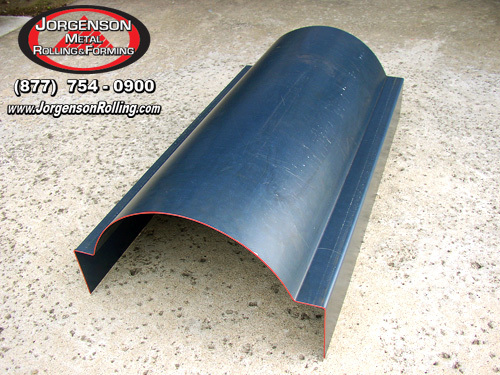 At Jorgenson Metal Rolling & Forming we also specialize in plate and sheet metal rolling and we can roll up to 1’ thick plate that is 10 feet wide, as well as structural steel rolling. These are custom formed Stair Pans that are made from ¼” thick tread plate, or what is commonly referred to as “Diamond plate”. At Jorgenson Metal Rolling & Forming we specialize in forming all types of bent sections on our 500 ton press brake using many different types of material such as diamond plate, expanded metal and galvanized sheet metal. 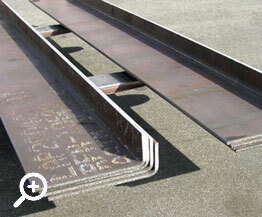 Our full service metal fabrication department can handle all of your fabrication needs and our rolling department can take care of any structural steel rolling needs that need to be met to get your job done. 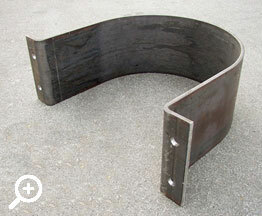 This is a piece of ½” thick x 12” wide carbon steel plate that has been cut-to-size, rolled, and bent to make a pipe strap, or pipe support. Making pipe straps, pipe clamps, pipe supports, pipe saddles and other pipe accessories is a specialty of ours, it showcases our ability to use multiple processes and make the part that is just what you need. 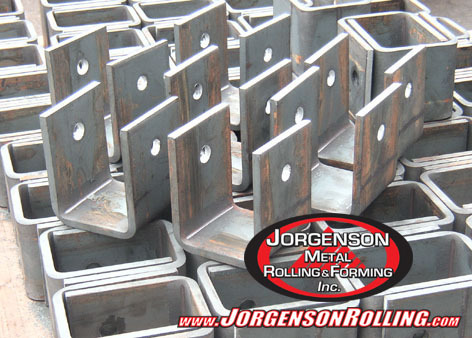 At Jorgenson Metal Rolling & Forming we take pride in our diverse range of capacities that allow us to take on many different types of projects. 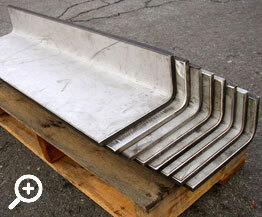 14ga steel sheared-to-size then rolled and bent to make a custom cover for a piece of machinery. 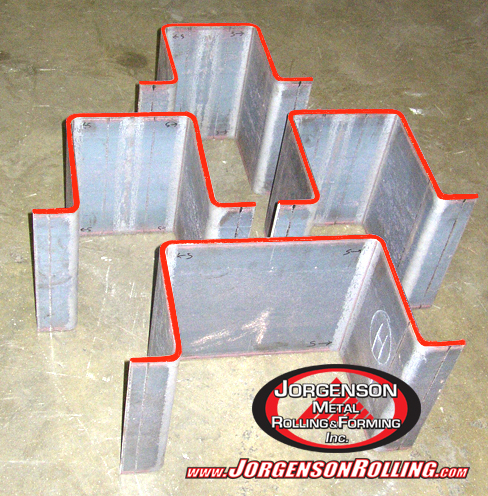 At Jorgenson Metal Rolling & Forming we can form sheet metal, steel or stainless steel plate, and other material types to make custom shapes based on a customer’s template, drawing, sketch, pattern or rendering. 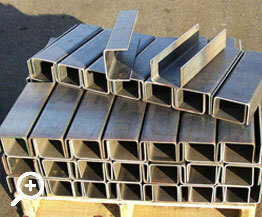 We can make your new or custom design become real using our specialized experienced in rolling and bending metal. 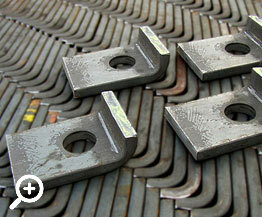 These are 3/8" plates bent to an acute angle to form a custom angle section. 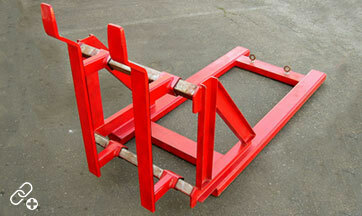 We have a bending capacity up to 500 tons by 18 feet, which allows us to bend up to 1/2" plate that is 10 feet in length. We also have a full service custom fabrication department in our facility that can take care of your shearing, punching and welding needs. Don’t hesitate to contact us with any questions on how we can provide you with fast, friendly service for all of your fabrication needs. This is 5/8” thick plate that has been bent to 90 degrees at multiple points. 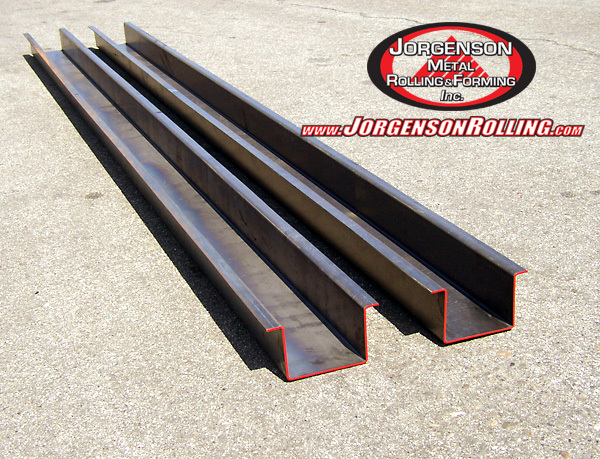 At Jorgenson Metal Rolling and Forming we specialize in bending plate and rolling plate, we also do angle rolling, tube rolling and pipe rolling. We also have a Custom Metal Fabrication department located in our facility, where we do shearing, punching and welding. 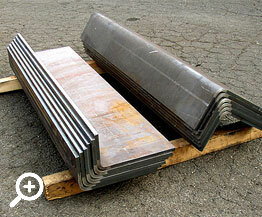 These are ½” thick stainless steel plates that have been bent to make a custom-formed angle or bent plate. Using our 18 foot x 500 ton press brake we are able to bend carbon steel, stainless steel, aluminum and many other types of plate and sheet to make custom-formed shapes like angles, channels, closure plates, hat sections, column covers, corner guards and various others. 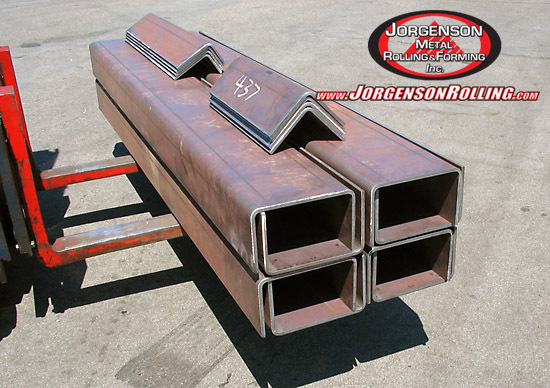 At Jorgenson Metal Rolling & Forming we listen to the customer’s needs so that we can put our broad capacities to work and provide exactly what is called for, on any project. 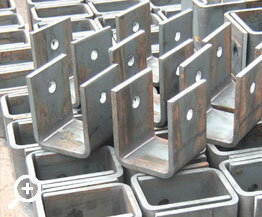 This is 1/2” thick plate bent at multiple points, to various degrees. 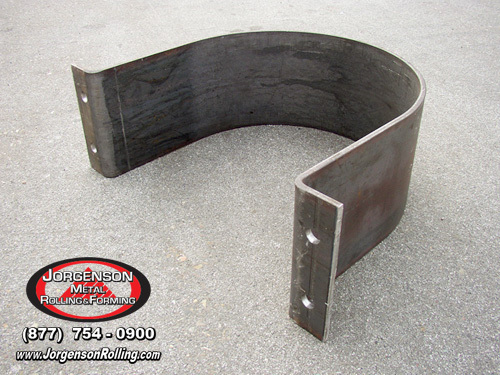 At Jorgenson Metal Rolling and Forming bending plate, as well as plate rolling, are just two of our many capabilities, we can also do sheet metal bending, tube bending and pipe bending. We also have a Custom Metal Fabrication department located in our facility with capabilities such as shearing, punching and welding. 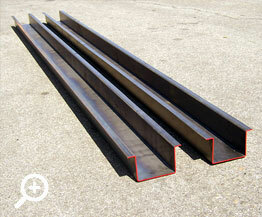 These are 1/2" plates bent in two places to form a custom channel section that is 10 feet in length. One top are some additional, smaller 1/2" plates bent in the center to form custom angle sections. Both of these shapes were formed using our 500 ton 18 foot press brake. 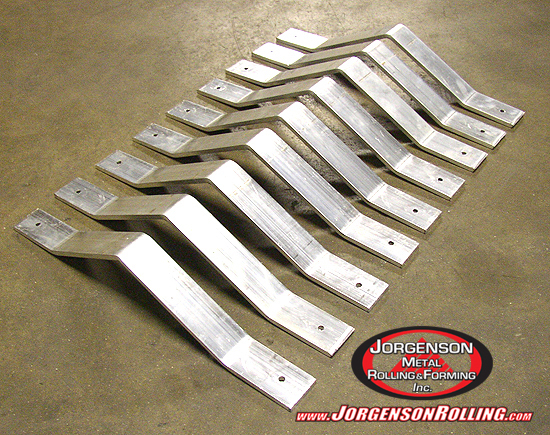 At Jorgenson Metal Rolling & Forming we specialize in plate and sheet bending, as well as plate and sheet rolling. 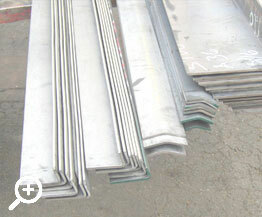 We can do plate rolling up to 1” thick that is 10 feet wide. 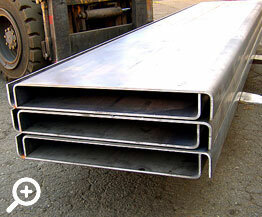 These are 1/8” thick or 11ga steel plate or sheet metal that is sheared to size and bent to make a custom C – channel in short sections. 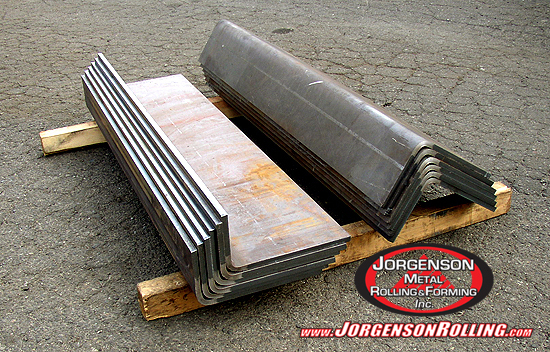 Here at Jorgenson Metal Rolling & Forming we specialize in bending sheet metal and steel plate to make custom shapes like angles, C – channels, Z – purlins, hat sections, and many other custom shapes to be used as metal brackets, steel shoes, metal clips, covers, steel guards, and other purposes. Contact us via email or by phone for more information about how we can help you with your metal bending or steel forming needs. 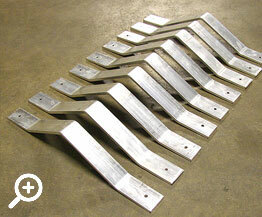 This is 3/8” aluminum flat bar that has been bent in three places and punched at each end to be used as a bracket. 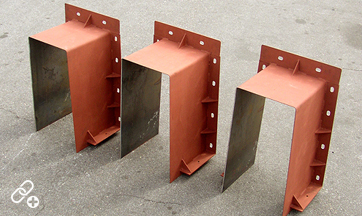 These brackets were bent using our 500 ton 18 foot press brake, which allows us to bend steel plate up to ½” thick by 10 feet long, and 3/8” thick plate up to 18 feet long. 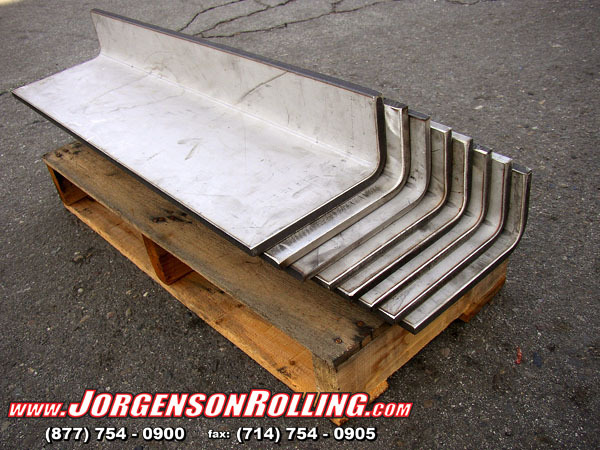 Bending and Forming is our specialty here at Jorgenson Metal Rolling and Forming. We also specialize in structural steel rolling using most shapes such as beam rolling, angle rolling, pipe rolling and tube rolling. These are small sections of ½” thick x 3” wide flat bar that have been sheared to size and bent to make a custom beam clip, or bracket. 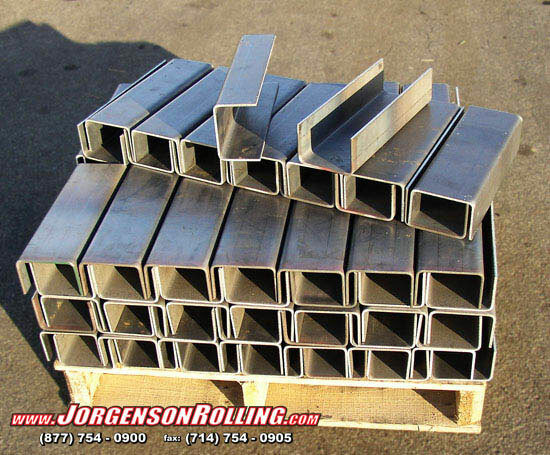 Here at Jorgenson Metal Rolling & Forming we like to put all of our capacities to work for our customer’s, making us a great one-stop-shop for anyone looking for custom rolling, bending and forming of mild steel, stainless steel, aluminum or any other type of material. Don’t hesitate to use our contact us page to send us more information about your needs, we look forward to helping. This is 3/8” thick plate that is 10 feet long and has been bent to 90 degrees. 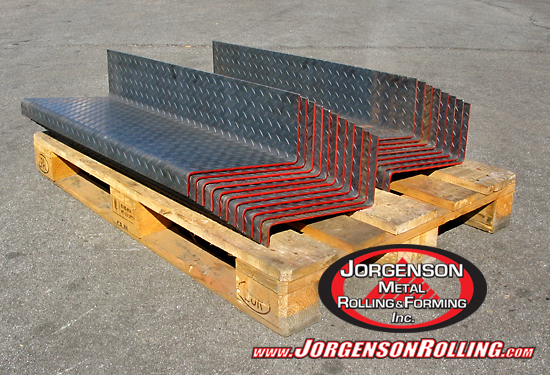 At Jorgenson Metal Rolling and Forming bending plate as well as rolling plate is just one of our many capabilities; our shop also has the ability to do plate rolling up to 1.0" thick and up to 10 feet in width. 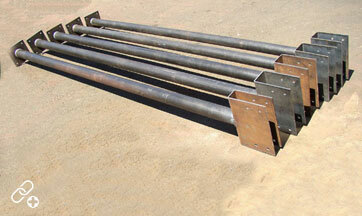 We also specialize in angle rolling, channel rolling, beam rolling and pipe rolling. 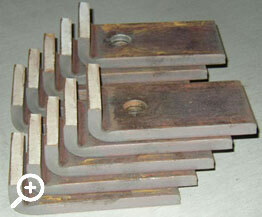 This is 5/8” thick plate that has been bent to 90 degrees at two points to form a saddle. This plate was also punched in our custom metal fabrication department, which is located in our facility. 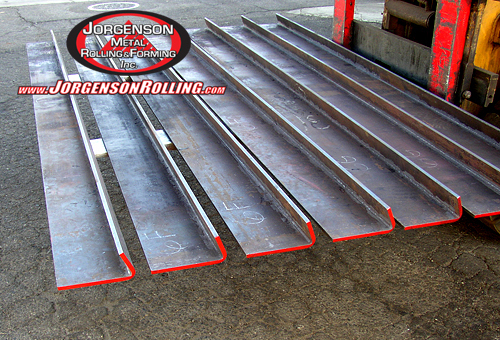 At Jorgenson Metal Rolling and Forming we can do heavy duty plate bending as well as rolling, our shop also has the ability to do plate rolling up to 1.0" thick and up to 10 feet in width. This is 3/4” thick plate that has been bent to 90 degrees. This plate was also sheared to size and punched. Plate shearing and punching are a part of our full service custom metal fabrication department, which is located in the facility. 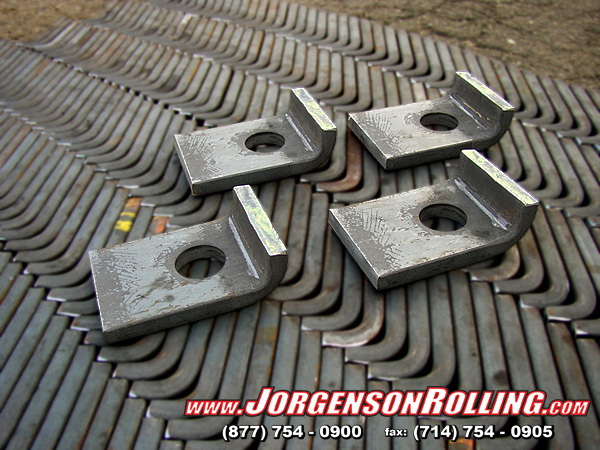 At Jorgenson Metal Rolling and Forming we can do heavy duty plate bending as well as rolling, our shop also has the ability to do plate rolling up to 1.0" thick and up to 10 feet in width. 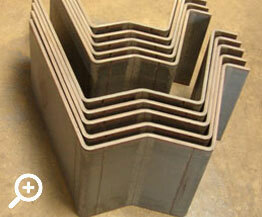 This is 1/4” thick plate bent to various degrees. This plate was also sheared to size in our custom metal fabrication department, which is located in our facility. 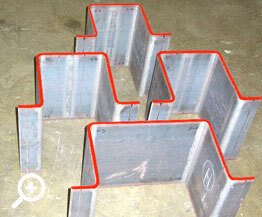 At Jorgenson Metal Rolling and Forming bending plate as well as rolling plate is just one of our many capabilities, we can also do sheet metal bending, tube bending and pipe bending.